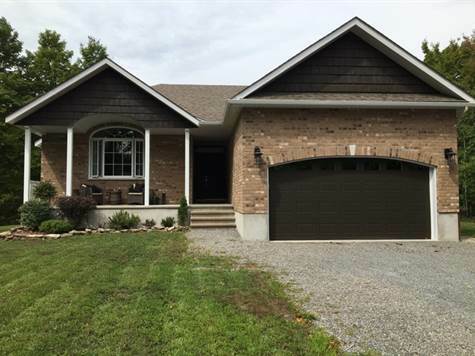 Bedrooms: 3 "4TH BEDROOM IN BASEMENT"
Garage: Double, Attached "INSIDE ENTRY & OVER SIZED PARKING"
Absolutely STUNNING & impeccably maintained 3+1 BDRM, 2 full BTH custom BUNGALOW on the most beautifully treed & totally private 1 acre lot. Gorgeous designer flare & detail throughout featuring richly stained maple hardwd flrs in open concept LR, DR, main flr BDRMs & hall, w/luxurious ceramic KTCHN, foyer & bathroom flrs, granite kitchen counters, tile backsplash, recessed lighting, stainless applncs, gas fireplace, soaring 9' ceilings w/vaulted ceiling in LR. 3 spacious BDRMs on main level, including one w/an exquisite custom built-in library. French drs lead from dining area to a large backyrd deck w/double wide stairs & a spectacular retractable awning! The LL features a cozy finished rec room & a 4th BDRM including a fabulous queen size barn board bedframe/headboard & matching dbl barn board sliding door closet (extra sound proofing on walls ideal for shift workers!). Other features: crown molding, tall baseboard trim, custom window coverings. VERY IMPRESSIVE - YOU WILL BE DELIGHTED! CALL TODAY FOR A SHOWING!